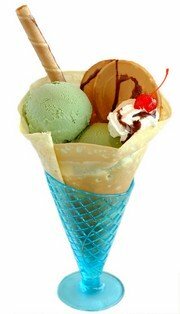 Want some green tea ice cream recipes? It is a popular dessert in many Japanese restaurants. However, you dont have to go out to eat to enjoy it. It is very easy to make at home. Homemade ice cream is always better. You can control what goes in it to make sure that only fresh, natural ingredients are used. Plus, you can make wonderful variations on the green tea ice cream recipes presented below that you won’t find in restaurants or stores. Basic Ice Cream - A true classic. Green Tea With Ginger - A sweet and spicy treat! I’ve included a recipe for candied ginger, so you don’t have to spend a lot of money in the spice aisle. Candied Ginger and Syrup - A sweet and spicy treat. Frozen Custard with Green Tea and Rosewater - Subtle and sophisticated. 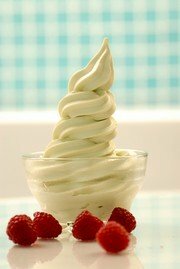 Vanilla Green Tea Frozen Yogurt - This has become a big hit in frozen yogurt shops in the Hollywood area. Why should celebrities have all the fun? You can make this tangy, guilt-free treat on your own! Pomegranate Green Tea Gelato - This rich treat combines two potent anti-oxidants: green tea and pomegranate juice. Step 1. In a medium sized pot, heat 2/3 cups water to boiling. Add the green tea bags, remove the pot from the heat, and let them steep for 5-7 minutes. Step 2. Remove the tea bags, squeezing them against the side of the pot with a spoon to get all the liquid out. Step 3. Simmer over medium low heat for 10-15 minutes, or until the liquid is reduced by half. Step 4. Remove from heat, and add the half-and-half and the sugar. Allow the mixture to chill for at least 1 hour in the fridge. Step 5. Beat the whipping cream until soft peaks form, and then fold in the green tea and half and half mixture. Step 6. Freeze in an ice cream maker, and then transfer to a freezer container. Step 1. Bring 2/3 cups water to boil in a small pot on the stove. Add the green tea bags and the slice of fresh ginger and turn the heat down to low. Step 2. Simmer for about 5 minutes, and then remove the tea bags. Step 3. Bring back to a boil, turn heat to medium, and cook until liquid is reduced by half. Step 4. Remove the fresh ginger and add the ½ cup of sugar. Add the half-and-half and chill in the fridge for about an hour. Step 5. Whip the cream until soft peaks form. Fold in the green tea mixture and stir until thoroughly combined. Step 6. Freeze ice cream in an ice cream maker according to the manufacturer’s instructions. Step 7. While it freezes, prepare the candied ginger ribbon: Place candied ginger in a food processor and process until it resembles coarse crumbs. Add the candied ginger to the ginger syrup. Step 8. Swirl the ginger ribbon into the ice cream during the last few minutes of freezing time. Step 9. Transfer to a freezer container. Step 1. Combine sugar and water in a large pan and bring it to a boil. Step 2. Add the ginger slices and boil rapidly for about 45 minutes. Step 3. Remove ginger slices and let them dry for about half an hour. Step 4. Roll them in sugar and let them continue to dry. Step 5. Store in an airtight container for up to 3 months. Step 6. For the syrup: Bring the liquid in the pot back to a boil and simmer it until it is reduced to thick syrup. Step 7. Keep the ginger syrup in the fridge when not in use. Step 1. Boil 2/3 cup of water on the stove and add green tea bags. Step 2. Turn heat down to low, simmer 5 minutes. Remove the tea bags, pressing them against the side of the pot to extract all of the liquid. Step 3. Simmer until liquid is reduced by half, and then add sugar. Allow liquid to cool to lukewarm. Step 4. Add half-and-half and whisk in egg yolks. Step 5. Simmer over low heat for 15-10 minutes or until mixture coats the back of a spoon. Step 7. Chill custard mixture in the refrigerator for at least an hour. It should be thoroughly chilled. Step 8. Place in ice cream maker and freeze according to directions. If the arrival of swimsuit season has you trembling, try this healthy fat-free recipe instead of the full-fat ice creams above. Step 1. Combine water and tea powder and let the mixture sit for 5 minutes. Step 2. In a large bowl, beat egg whites until stiff peaks form. Step 3. In a separate bowl, combine yogurt, green tea, and honey. Step 4. Add yogurt mixture to egg whites and gently fold in. Step 5. Freeze in an ice cream maker and then transfer to a freezer container. Like green tea, pomegranates are known for their antioxidant content. Step 1. Pour the hot water over the tea and let it stand for 5 minutes. Step 2. Add pomegranate juice, pomegranate molasses, and half-and-half. Step 3. Whip cream in a separate bowl until stiff peaks form. Step 4. Whisk pomegranate/green tea/half-and-half mixture into the whipped cream and freeze in your ice cream maker. While this ice cream won’t help shrink your waistline, you can at least take comfort in the one-two antioxidant punch of green tea and dark chocolate! Step 1. In a medium sized pot, heat 2/3 cups water to boiling. Add green tea bags, remove from heat, and let them steep for 5-7 minutes. Step 3. Simmer over medium low heat for 10-15 minutes, or until liquid is reduced by half. Step 4. Remove from heat, and add the sugar and the half and half. Allow mixture to chill for 1 hour in the fridge. Step 5. Beat whipping cream until soft peaks form, and then fold in green tea and half and half mixture. Step 6. Freeze in ice cream maker. Add grated chocolate during the last 5 minutes of freezing time.